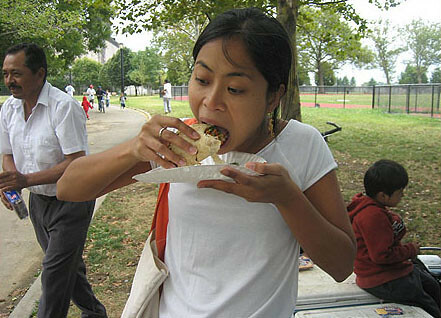 I have to admit that we didn’t drive from Harlem all the way down to Red Hook to look for a good taco. We made the trip to check out the Fairway Supermarket that opened a few months ago and do our grocery shopping for the week. 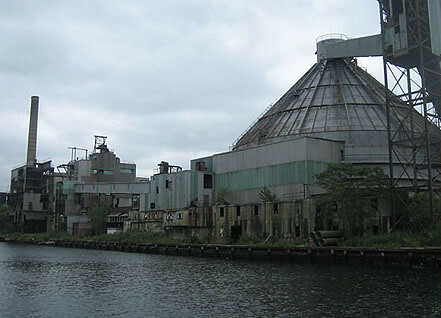 Walking along the waterfront of Red Hook, you’ll be reminded that the city was a port city. Giant machines, old warehouses, heavy containers, big ships, abandoned piers and the squawking seagulls make up the view. There is no subway close to the water so visitors need to have a car or trek from Carroll Gardens to get to Red Hook. It’s probably this inconvenience that’s stopping Manhattan folks from coming and moving in droves. But when you get there, you can imagine the old-school blue-collar New York way before the cafÃ©s and art galleries–and Fairway–started to open up in the neighborhood. Gentrification is well on its way, but who am I to snort when I live in one of the newest buildings in west Harlem? 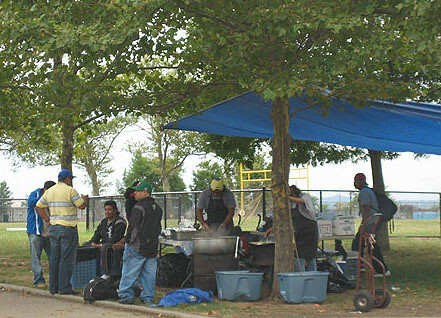 The Times featured the tents outside the Red Hook baseball fields last week where all kinds of different foods are sold. We wanted to pass by and look for the pupusas we had in El Salvador and to slurp the vinegar goodness of Ecuadorian ceviche. We thought that if we find a good taco, then it would just be icing on the cake. 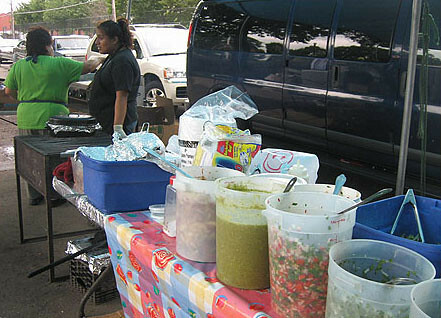 Little did we know that we’d actually find the best taco. My search this year ends. We parked our car and walked towards the park along Bay and Clinton Streets where we could already see blue tents set up for the forming lunch crowd. On Henry Street, however, we spotted a lone table with a tarp tied to a tree, so we decided to check the goods there before heading to the busier part of the field. 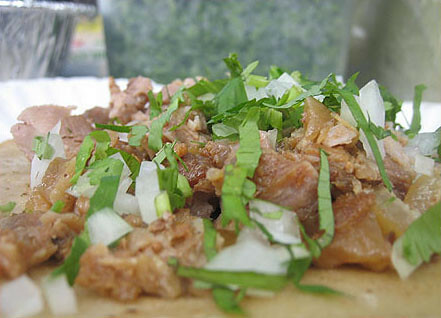 Large pieces of pork are stewed in a vat of boiling marinade then cut up into smaller portions before filling soft tortillas with finely chopped onions and cilantro. I haven’t tasted every taco sold in New York City but I’m going to have to lay it out there and say that this is the best taco I’ve had so far. As a comparison, we bought a beef steak taco from the last stand on the far side of Clinton. Although it was good, it wasn’t enough to make us forget about the taco we just had. The Dr., my brother and I all voted for the first taco as the better one. 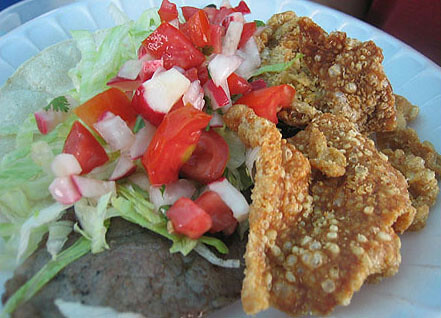 The secret in the second taco was the chicharron, or pig’s skin deep-fried into crunchy paradise. 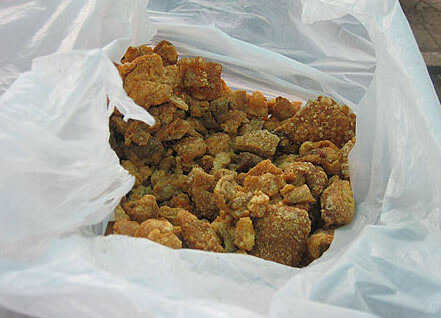 I think the lady was thrilled that we asked for extra chicharron when she was putting a taco together for us. wow! you’ve got guts!! 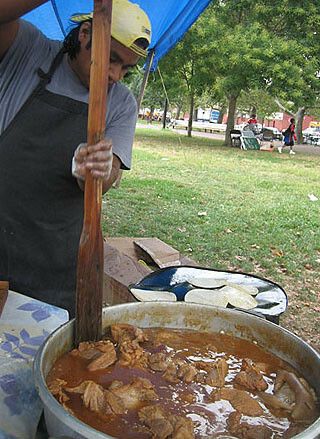 (or a really strong stomach). . .always wanted to try the mobile taco stands or the makeshift restaurants in the street corners, but have always been afraid. . of the potential for food poisoning. . .
Looks like you can feed about 200 with what they have.